From 'Art As Life: A New Portrait of Bill Ritchie,' by Philip Hicks. Arts Atlantic 55, Spring/Summer, 1996, p.27. William Ritchie was born in Windsor, Ontario, in 1954. After attending several art colleges in Southern Ontario, Ritchie moved to Halifax, where he graduated with a Bachelor of Fine Arts from Nova Scotia College of Art and Design in 1976. That same year, he travelled to Nain, Labrador, to work for Memorial University of Newfoundland's Artist-in-the-Community program. While there, Ritchie met fellow artist Gilbert Hay. The two opened a community craft centre in Nain, which catered to the tourist and collector market. They also influenced each other's art. Ritchie taught Hay lithography and silkscreen printing techniques, and Hay taught Ritchie about Inuit mythology and survival tactics in the Labrador wilderness. Together, they created a series of lithographs illustrating various Inuit legends, which the Memorial University Art Gallery (now The Rooms Provincial Art Gallery) organized into the joint exhibition Labrador Inuit Mythology Series in 1982. After his six-year residency in Nain, Ritchie moved to Newfoundland to work at St. Michael's Printshop, located on the Avalon Peninsula's Southern Shore. He lived there for several years in an isolated cabin with no running water and with electricity provided only by a small generator. Since 1988, he has also been working for about three or five months every year at Cape Dorset's Kinngait Studios, an internationally renowned printmaking centre founded by the West Baffin Eskimo Co-operative in 1959. In 1997, he also opened Caplin Cove Press, a small fine art printshop in the community of St. Michael's, on Newfoundland's Southern Shore. In addition to his printmaking, Ritchie also works in watercolour, acrylic paint, film, and digital media. His earlier work tended to be monochromatic, but he later expanded his colour palette. Ritchie's art draws heavily upon his interest in natural history, the northern wilderness, and Inuit mythology. 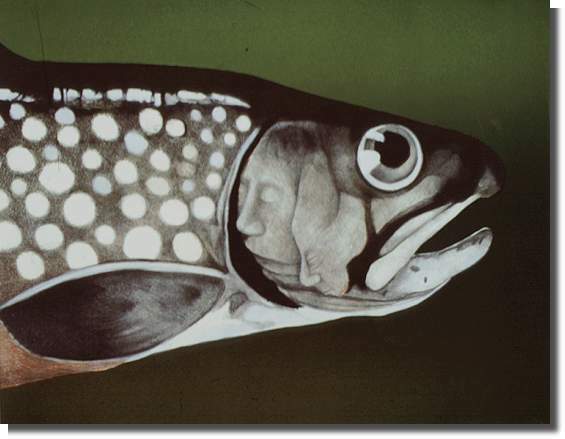 In the lithograph Labrador Inuit Mythology Series: Trout 4.20, for example, a fish has human faces transcribed into its gill. This alludes to the interconnectedness and interdependence of all natural things, and to the stories of metamorphosis that recur in Inuit mythology. In addition to The Rooms Provincial Art Gallery's Permanent Collection, Ritchie's work is part of private and public collections, including the Government of Newfoundland and Labrador, the Art Gallery of Hamilton, and The Canada Council Art Bank.